The first striking thing with Syos mouthpieces, at the very first try, is there incredible ease-of-playing, in all registers. The sound is beautiful, powerful and warm. And it is also flexible and adapted to our tone research. The sound of Ferdinand Doumerc is bright and very powerful. The mouthpiece we created for him gives him the possibility to deploy easily this timbre in all the registers of the tenor saxophone. 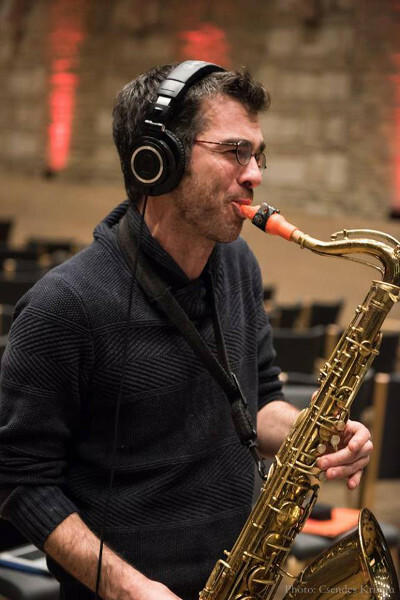 After his studies in musicology in Toulouse, Ferdinand begin to play with varied bands as saxophonist and composer, while learning a wide diversity of instruments (baritone to sopranino saxophones, flute). In 2003 with Julian Babou and SOnny Troupé, he created la Face cachée des sous-bois, an afro trio jazz funk which lasted more than 10 years. He also founded in 2004 Pulcinella, a free jazz and tango quartet which recorded 7 discs, gives more than 500 concerts in France and abroad and collaborate with many artists (Leila Martial, Andreas Schaerer, Frédéric Gastard, Émile Parisien, Daniel Casimir, Troyka...). He also plays for 15 years in several big bands, especially the Big Band Brass (with Didier Lockwood, James Morrison and Ivan Jullien). He's an active member of the Toulouse jazz scene: co-founder of the electro-jazz trio Mowgli, leader of Le Chiffre (James Bond OST arrangements), members of The Headbangers (jazz/rock combo), of the sextet Stabat Akish or Initiative H, a new big band who played with Médéric Collignon and Thomas de Pourquery. His love for afro-american music lives in various soul music projects (Gimenez-E, Dounshaq, Supersoul brothers, Loretta), in a tribute to Herbie Hancock (Hancock en stock) and in his own jazz funk quartet, La Tarentule.